A recent report suggests that the problem is only worsening, posing another headache for the junta ahead of polls next year. Despite the overwhelming focus in the international media on elite politics in Thailand, one of the key issues within the country has long been inequality evident among different areas and groups. Thailand’s ranking in a recent report has once again highlighted this trend, with implications for Southeast Asia’s second biggest economy as it heads into expected elections next year. According to the 2018 Credit Suisse annual Global Wealth Report of 40 countries, the top 1 percent of richest Thais now own a whopping 66.9 percent of the nation’s wealth, while the poorest 10 percent held 0 percent. That makes Thailand the world’s least fair country in wealth distribution in the study, ahead of Russia, Turkey, and India. While inequality is not a new issue for Thailand, the fact that it is now topping a list where it was third in 2016 suggests some worry about whether things are worsening on this front. 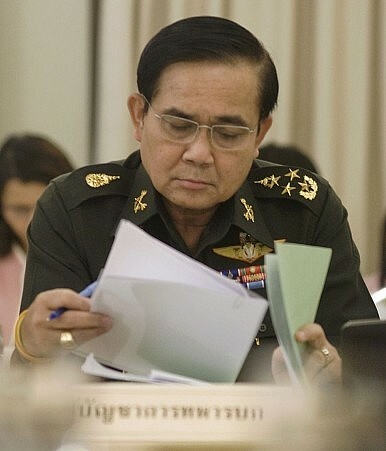 It is also hardly a good look for General Prayut Chan-o-cha, who has reigned as prime minister since seizing power in a coup d’etat in May 2014 and is a potential candidate for elections expected on February 24. The report feeds into a narrative that could be advanced by opponents that the coup favored the ruling elite, and that they have grown rich under Prayut’s regime, while ordinary Thais have missed out on the benefits of modest economic growth of 3 to 4 percent a year. Outside the top four, there were no other countries in the world where the richest 1 percent controlled more than half their country’s wealth, and Thailand looked even worse when compared with the likes of Belgium and Australia. They came in first and second as the fairest of countries for wealth distribution, with the top 1 percent controlling 20.1 and 22.4 percent of the wealth, respectively. The report has unsurprisingly gotten attention in Thailand. Local media quoted prominent Thais quoting the report, and the story went viral online, with Thais, financial analysts, and budding citizen journalists all quoting the findings from Credit Suisse extensively. Most blamed the ability of monopolies to entrench themselves, a tax system in need of genuine reform, and a lack of democratic freedoms for the shift in wealth. That prompted a state entity, the National Economic and Social Development Board (NESDB), to dismiss the report with claims its information was outdated. Irrespective of the veracity of individual, specific claims, the reality is that the report and its findings are an economic indictment of Prayut. The report’s recommendations include a combination of welfare and neoliberalism, which thus far have seemed to be unlikely to be found under a junta or junta-led government. Thanathorn Juangroongruangkit of the Future Forward Party, a young leader and one to watch ahead of the elections, was far from convinced. “I think the government is defending itself and the giant capitalists who are defending it. Everybody knows that dictators and oligarchs support each other,” he told the Nation newspaper. The traction that this report has gotten in Thailand is a cautionary tale for the junta and for the country’s elites more generally. A major factor in Thailand’s protracted domestic political transition in recent years has been the gap between old elites and a new wave of populism emerging from segments of the population that are demanding that concerns such as inequality be addressed. For instance, it is no coincidence that wealth distribution was also a key election plank addressed by the widely discredited former Prime Minister Thanksin Shinwatra and his sister Yingluck who was ousted by the coup that delivered Prayut his power. Their affordable healthcare policies and rice subsidies also proved popular with the masses in spite of justified criticism on some aspects. Thailand’s junta and its elites more generally would do well to keep this in mind as the country heads to the polls next year. Because for all the focus on personalities and elite politics, Thailand’s protracted political challenges cannot be solved without addressing the glaring gap between those at the top and the rest of the country. Alphonsus Pettit is a historian and contemporary writer on East Asian affairs. The premier has intensified his effort to strengthen his brand in the run-up to much-anticipated polls. How Thailand’s Ruling General Could Stay in the Prime Minister’s SeatWhat Does Thailand’s Royal Shockwave Mean for its Future Politics?What Thailand’s Elections Can and Can’t Do for its DemocracyThailand’s Democracy Cannot Survive Another Election DelayWhat Do Thailand’s New Economic Numbers Say About Its Political Future?